“One child, one teacher, one book and one pen can change the world”, said Nobel laureate Malala Yousafzai, the global icon of girl child education. Working in the same direction, infotainment broadcaster National Geographic (Nat Geo) is looking to mark International Women’s Day in a way that makes a difference. In line with the Nat Geo legacy to educate and illuminate minds, Nat Geo launched #StandWithAGirl. A fund-raising initiative to support education and empowerment of the girl-child, #StandWithAGirl has also received support from celebrities like Shabana Azmi, Sushmita Sen, Dia Mirza and Gul Panag. ‘He Named Me Malala’ is the story of Malala who braved bullets to further the cause of girls’ education and showed everyone the importance of standing up for girls’ rights. The premiere of this special ‘Nat Geo Megadoc of the Month’ will be completely commercial-free. 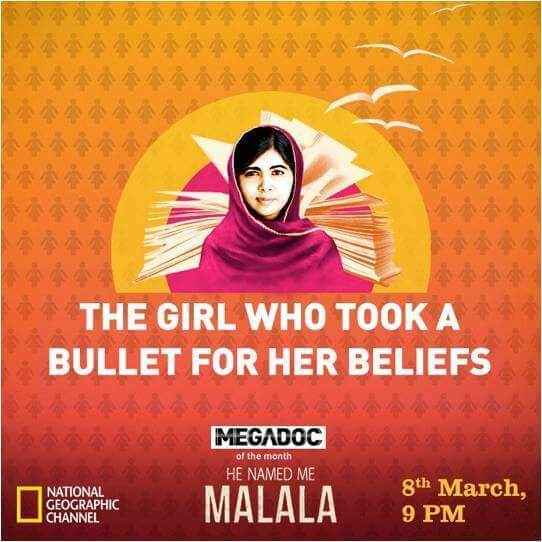 On the occasion of International Women’s Day, Nat Geo is airing the television premiere of the documentary ‘He Named Me Malala’ on 8 March at 9 pm.